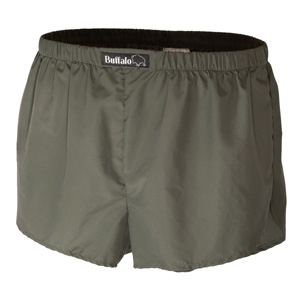 Buffalo UltraLite Boxer Shorts are a collaboration between Camouflage and Buffalo Systems. Fast wicking, breathable and ultra-lightweight boxers made to Buffalo's usual exacting standards. Made from a texturised Pertex 614 weave, the Buffalo UltraLite boxer shorts were born of frustration with standard cotton underwear. Its lightning fast ability to dry on the body makes moisture retention in sensitive areas a thing of the past - our own testing in high impact sports and martial arts has proven their ability to surpass ordinary highstreet garments. Lightweight, comfortable (in fact, it feels like you're not wearing any) and breathable with excellent moisture wicking brings underwear into the 21st century. Exclusive to Camouflage, made by Buffalo - you won't find these anywhere else..